While looking for some Christmas iPad apps to keep my oldest entertained I found the newly introduced Dora’s Christmas Carol Adventure game/book on iTunes. 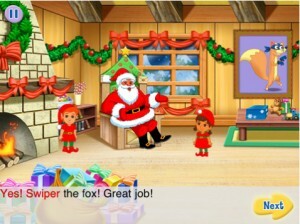 Modeled after the popular Dora’s Christmas Carol movie that was introduced last year, this application tells a story and gives your child the opportunity to help Swiper get back on Santa’s nice list. Just like in the TV show, kids are asked to help Dora complete her tasks and in this case earn Swiper the 3 ornaments and 1 star needed to show Santa that he can be good. My son loved this app because he actually could see the help he was giving work, unlike when he helps her on TV and has to use his imagination. The graphics are really nice and the story is very responsive as opposed to some that are a bit slow. Santa and Dora read the story, which is fun for kids who are looking forward to the big night later this month! I highly recommend this for little Dora Fans. At just $4, this application offers more value than a book and costs a fraction of the movie! Kid Tested: Beaba’s New Nightlight – Pixie! The Urbans Touchdown in Sydney! Heidi Klum and Seal Shop At The Grove With Their Crew!